An 18th century mosque and gravestones in the adjoining cemetery have been vandalised in the village of Kruszyniany, north east Poland. The incident apparently occurred in the early hours of Sunday morning, just after Polish Tatars began observing Ramadan on Saturday. 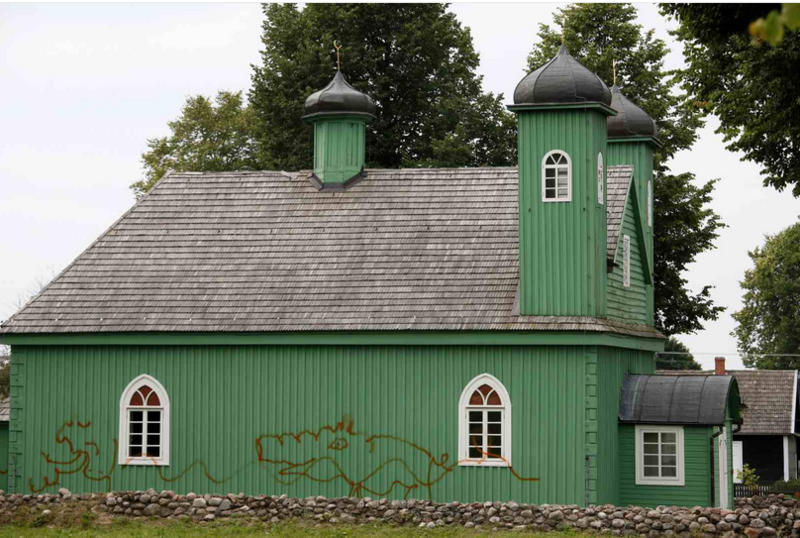 The culprit sprayed a vast pig onto the side of the mosque, which is one of Poland’s oldest Muslim houses of worship still used by the country’s Tatar community. 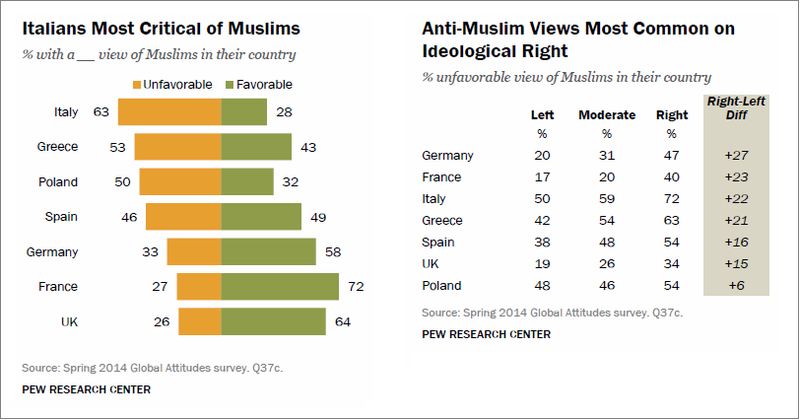 On the eve of elections to the European Parliament, the Pew Research Center has published its latest report on public opinion in the EU. It is based on face-to-face and telephone surveys in seven countries: France, Germany, Greece, Italy, Poland, Spain and the United Kingdom. The far-right Polish Defence League (PLO) has launched “patriotic patrols” in Poland’s bars and nightclubs in a bid, it says, to protect Polish women from being chatted up by Muslims. 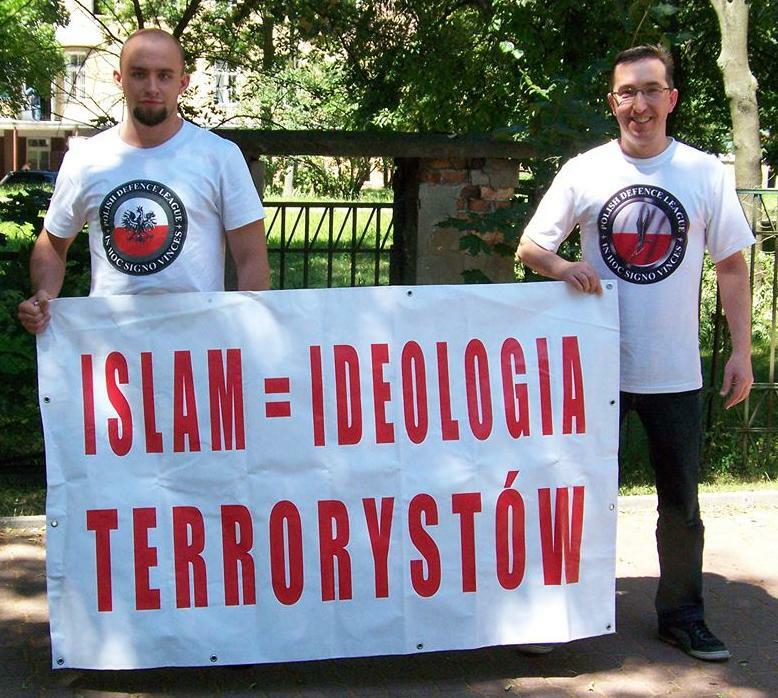 The Polish Defence League, which describes itself as “showing the true face of Islam and acting against the Islamisation of Europe,” started the operation in December in cities including Warsaw, Poznan and Krakow. “We are there to observe how Muslims behave and to intervene,” the league stated on its official web site. According to the PLO, which currently has 3600 fans on its Facebook page, Polish women are warned during the patrols about the “threats” of getting involved with Muslim men, the Gazeta Wyborcza daily reports. 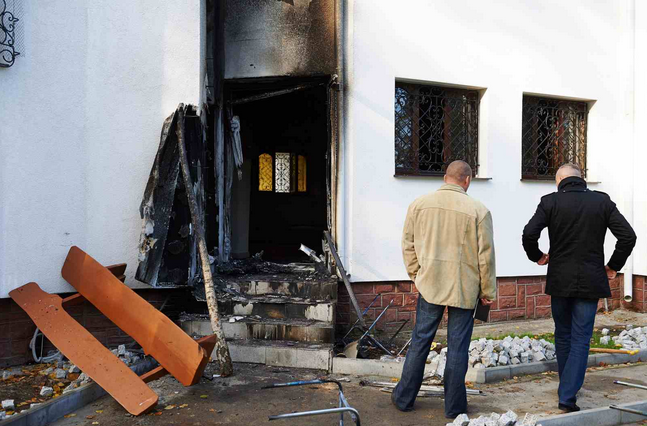 Representatives of the Jewish community of Gdansk, Poland, said the torching of a mosque had “frightening connotations” of the Nazi-inspired Kristallnacht pogroms against Jews. The association was inescapable, three of the city’s Jewish leaders wrote in a statement Thursday. 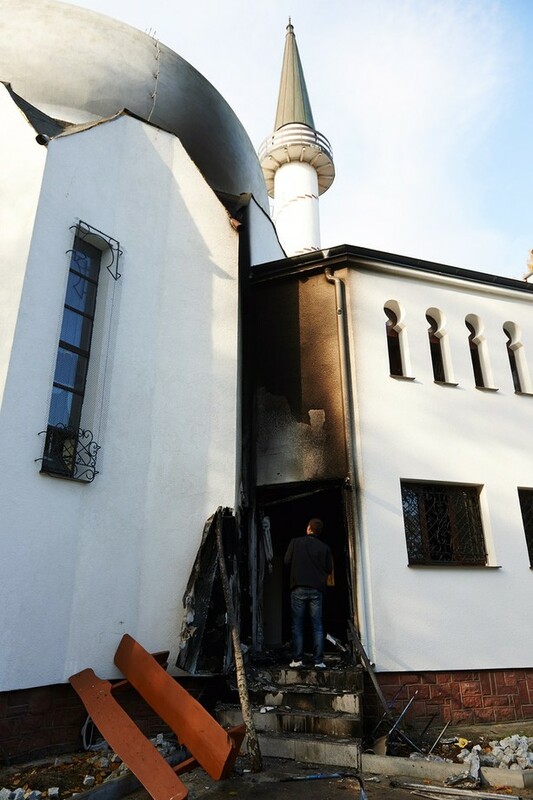 “On the eve of the 75th anniversary of Kristallnacht, during which synagogues were burned in the Free City of Gdansk, the burning of the mosque must bear frightening connotations,” the statement said. Chief Mufti Tomasz Miskiewicz has admitted to carrying out the “ritual slaughter” on Tuesday in the village of Bohoniki, north east Poland, in spite of a state-imposed ban on the practice. “I will not evade responsibility for this and I am at the disposal of prosecutors,” he has said. “I carried out [the slaughter] myself, maintaining the culture and heritage of the Polish Tatars and Muslims,” he added. Poland’s Muslim community decided Tuesday to refrain from the ancient tradition of animal sacrifice for the Eid al-Adha holiday amid protests by animal rights activists and a controversial ban on halal slaughter. “For the first time in hundreds of years, there was no ritual slaughter here today for the Eid feast,” Michal Adamowicz, a spokesman for the community, said Tuesday in the Muslim Tatar village of Bohoniki, eastern Poland. The country’s top Muslim leader, Mufti Tomasz Miskiewicz, said his community was suffering a “witch hunt” as activists protested against halal slaughter near a small wooden mosque in the village, where other Muslims appeared ready to slaughter sheep. Poland’s Muslim community on Tuesday said a controversial nationwide ban on halal and kosher slaughter, which has spurred intense debate at home and abroad, was invalid under European law. The EU directive “applies in Poland and in this case it supersedes national law,” Poland’s top Muslim leader, Mufti Tomasz Miskiewicz, said, quoting an expert legal analysis commissioned by the Muslim community and the meat industry. Animal rights activists have hailed the ban, but Jewish and Muslim leaders in overwhelmingly Catholic Poland argue that it violates their religious freedom and Israel has called it “unacceptable”. Farmers and exporters of meat to Israel and Muslim countries, who exported up to 350 million euros ($460 million) worth of kosher and halal meat a year before the ban, have also condemned it. Agriculture Minister Stanislaw Kalemba will support Poland’s Jewish and Muslim minorities in a prospective bid to reintroduce kosher and halal slaughter methods. Speaking to journalists in Brussels, Kalemba criticised Friday’s vote in Poland’s lower house of parliament, which rejected a repeal of the ban. Kalemba said there were “constitutional doubts” about the ban, stressing articles in the constitution preserving the traditions of national minorities and the cultivation of rites by religious groups. Poland’s parliament on Friday rejected the ritual slaughter of livestock for food, angering the Jewish community as well as farmers and exporters of meat towards Israel and Muslim countries. Lawmakers struck down a government bill that would have reinstated the practice – a key tenet of the Jewish and Muslim faiths – with a vote of 222 against, 178 in favour and nine abstentions. Ritual slaughter has been banned in Poland since January 1 after a Constitutional Court deemed it incompatible with animal rights law. Supporters of the practice had pegged their hopes on the bill, whose rejection the European Jewish Congress said it “strongly condemns”.